The Dakota Condominiums are a unique Midtown Atlanta condominium living option! The building is located on one entire city block, bounded by Juniper Street, 6th Street, Piedmont Avenue, and 7th Street. The all brick exterior and mid-rise building style (only 6 stories) make The Dakota a perfect option for those wanting the Midtown lifestyle but not a high-rise building. Floor plans range from 1 and 2 bedroom “flats” (all one floor) to one building that has all townhome-style condos. The ground floor homes are unique that they open directly onto courtyards and then out to the street. The 3rd/4th floor homes have small walkout balconies. The pool and fitness room, along with gas grills are located on the roof-top….no worries about no sun here! The homes surround the parking garage, and it has ample wide spaces for today’s SUV lover! 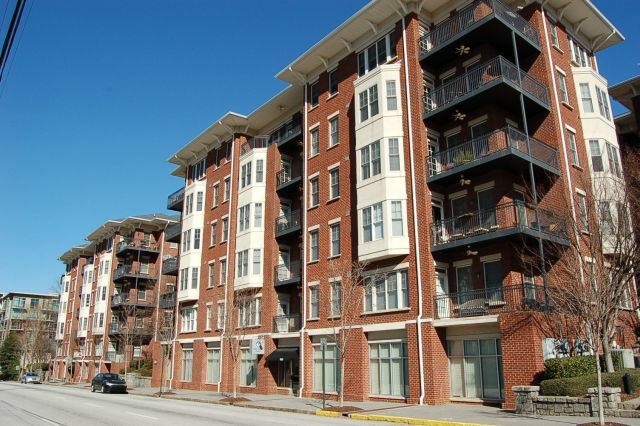 Visit our community page @ The Dakota Condominiums to learn more about this Midtown Atlanta condominium building, view pictures of various homes and search for homes for sale. If you are looking to buy or sell in The Dakota Condominiums, understanding the market trends will better help you make an offer on a home for sale, or determine your pricing strategy if you are selling your Dakota Condominium. If you are looking to Buy or Sell a home at Dakota Condominiums, MyMidtownMojo can help! Selling: Do you want to sell your Dakota Condominium? Call us today at 770.713.1505 to schedule your free market analysis of your home. Or you can complete our Seller Information Form. Buying: Are you looking to buy a Dakota Condominium? We can search for you, and even build you a custom website that will alert you daily of any new listings in the building. Just complete our Buyer Information Form and we’ll get to work! Data last updated: 4/17/19 8:52 AM PDT.